The syndicate idea was born after a gestation of two decades. It made its appearance in 1861 in the form of auxiliary service, the by-product of a daily newspaper. During the next decade this infant industry emerged from its swaddling clothes and grew so rapidly that it was no longer dependent upon its parent. Then it struck out boldly to take its place in the life of a nation entering the era of economic and social revolution that followed the greatest civil war in history. 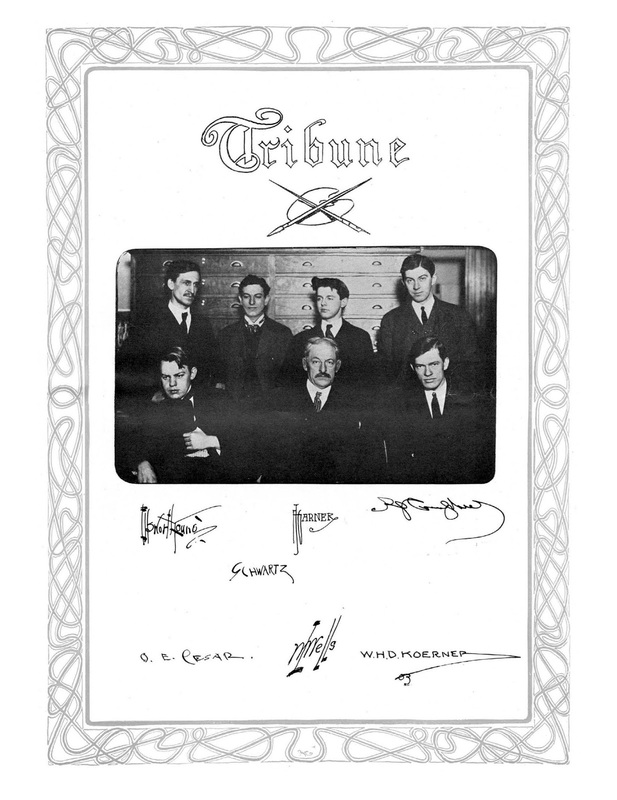 Before the last echoes of the cannon had died away, the newspaper syndicate was established as an independent business. up a plan for an association of publishers to establish a central office for printing inside sheets containing news and feature material appropriate for the common needs of their papers. He also proposed to include advertisements in the service as a source of revenue for the enterprise. advertisements in their printed sheets and they continued to do so for several months. Except for these and the other advertisements already noted, however, the Madison publishers do not seem to have made any special effort to get more advertising as a source of revenue for their enterprise, even though Terry's projected plan suggested its advisability. As will be seen later, this neglect was to be a costly one for them. We have on our table copies of the Baraboo Republic, Mauston Star, Fox Lake Gazette, and the Columbus Journal—the inside pages of which are exact duplicates of each other. The inside of these papers, and some others, are printed in Madison at the Journal office, and sent out to their respective places of publication, where a few columns of advertisements and local news are added and the sheets are put forth as home productions. If this practice is to become general, a score of journeymen printers will be sufficient for the whole state. The idea would be worthy of a "ratting publisher" or a "strapped printer," but we can hardly consider it a legitimate business. The plan, if universally adopted, would give almost absolute control of state affairs to the editors who should be employed to do all the thinking for the papers in the state.—Portage (Wis.) State Register. We, too, have before us copies of the above named papers and are free to say that we never so thoroughly disagreed with anything we have found in the Register. The idea that this plan, if it became general, would be ruinous to journeymen printers, is worthy of that class of mind that opposed the introduction of grain cradles, threshing machines, reapers, sewing machines, etc., as innovations that would be ruinous to the interests of laborers, or of the old lady who denounced the dealers in kerosene as doing such injustice to the whales. We believe the plan, judiciously managed, would be of vast benefit to every interest in society, printers included, and can think of a good many arguments in support of our belief. But if it were otherwise, if it is possible for publishers to furnish their subscribers with a better paper for the same money, and at less expense to themselves, it is manifestly their duty to do so, though one-half the printers in the state are driven from a profession not remarkably lucrative. The fear that a "couple of editors will, in fact, edit all the country papers in the state," is equally groundless, even if the common pages were gotten up by men who had sufficient brains to spread over so much surface. There is no more ground for fear than there is that the telegraphic reporter for the Associated Press will control all the papers that print the reports. No considerable amount of editorial matter which looks to the manufacture or control of public sentiment is permitted to be furnished the papers spoken of; and though we think the Journal's style of doing the work could be vastly improved, it is undeniable that the papers in the arrangement are decidedly better than before, some of them by nearly the 14 columns of reading matter furnished by the Journal. The spare time gives the editors (most of whom probably stood at the case the greater part of the time) an opportunity to polish their editorials and pick up local news, and the result is what might be reasonably expected—a decided improvement in both departments. We say to our friends, perfect your plan and achieve success, and scores of publishers who can avail themselves of its benefits, and thousands of subscribers who will gain much knowledge thereby, will rise up and call you blessed.—Berlin (Wis.) Courant. We submit the following as indicative on one hand, by an interested neighbor, and on the other by a disinterested journal a hundred miles distant, concerning the new country journal style. That the latter is the plain common sense view of the matter, it will not need a second perusal to determine. Evidently other Wisconsin publishers felt the same way about it for throughout 1863 Atwood and Rublee continued to add to their list of customers until they were supplying approximately 30 weeklies with the service. The syndicate business of the Wisconsin State Journal was so profitable that it had the inevitable result of bringing competition into the field. 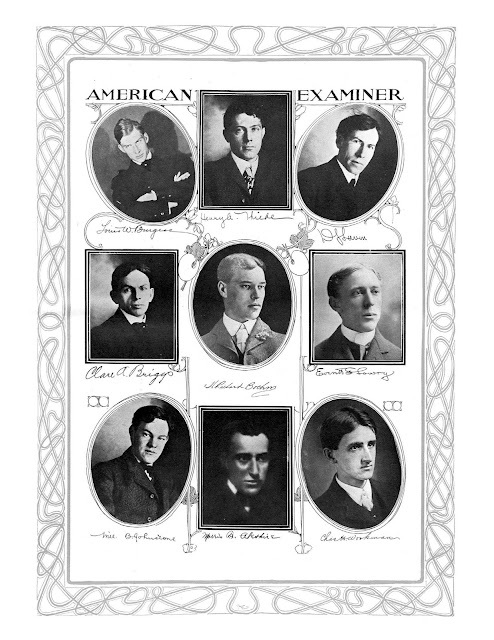 The competitor was the Evening Wisconsin, published by Cramer, Aikens and Cramer at Milwaukee. 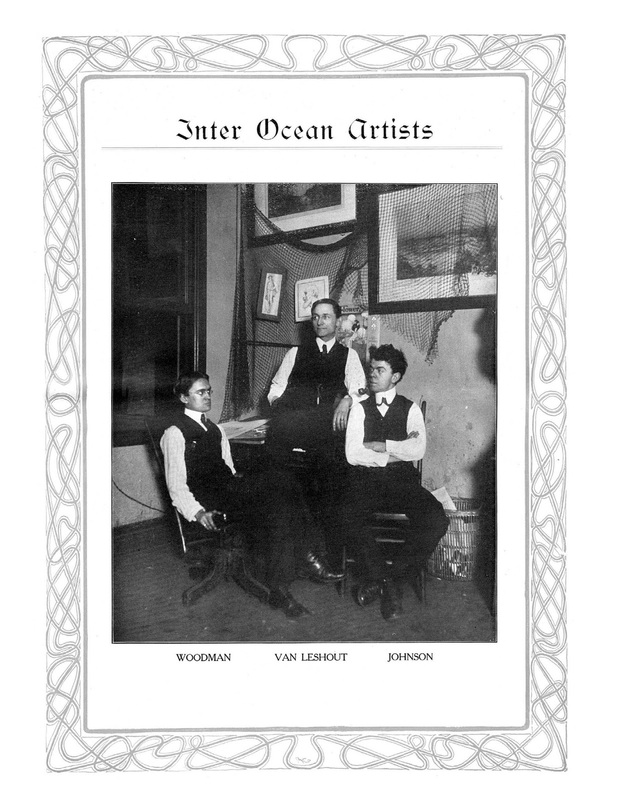 This paper had been established as the Wisconsin in 1847 by William E. Cramer, another transplanted Easterner, who was its editor and senior proprietor for 45 years.1 The business manager was Andrew Jackson Aikens, who had experimented with the use of printed sheets in Woodstock, Vt.
After his career as a country publisher in Vermont and New York and as an employee of the state printing office in Boston, Aikens had been appointed western correspondent for the New York Evening Post in 1853. During his travels in the Middle West he became acquainted with Cramer and was offered a position on the staff of the Wisconsin. Within a year he was city editor of the paper and in 1857 Cramer made him business manager. The founder's nephew. John F. Cramer, joined them in Milwaukee later on and Aikens, who had a natural aptitude for mechanics, was placed in charge of the job printing shop run by the firm. He occupied this position at the outbreak of the Civil war. and more men as replacements for the thousands slaughtered in the wilderness, printers in Wisconsin, as well as in other states, began "leaving the case and shooting stick for the army and real shooting irons." Consequently other publishers had the same difficulty in getting out their papers unassisted that Kellogg did in 1861. One of them in a little town near Milwaukee solved his problem in the same way as the Baraboo publisher had done. He ordered printed sheets from the Evening Wisconsin and Aikens supplied these from type that was kept standing after being used in the weekly edition of that paper. 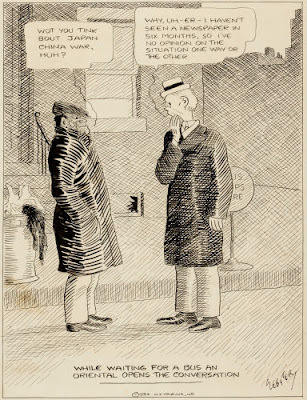 When a second publisher also applied for aid, Aikens, noticing that the second paper was the same size as the first, supplied him with the same service. When this service continued for several weeks with neither publisher complaining about the similarity of the material furnished their papers, Aikens decided to build up the business of his job shop by seeking orders from other weekly publishers. He realized that there would be little profit in the work from the price he was charging these two publishers. He remembered the Boston Business Directory of his Woodstock days and saw the possibility of adapting it to his present scheme. Accordingly he approached a number of merchants in Milwaukee with a plan for inserting their advertising cards in the printed sheets which he meant to supply newspapers in the small towns throughout the Milwaukee trading area. Aiken's circular announcing the Evening Wisconsin readyprint service resulted in several immediate orders and within a short time he was supplying more than 30 weeklies. His practical application of the advertising plan, which Terry had proposed but had been unable to develop, enabled him to reduce the cost of the printed sheets almost to that of white paper. Thus he was able to extend the scope of his operations. but more potent was the cheaper price of the printed sheets. After two years of unsuccessful attempts to meet the competition of the Milwaukee publishers, Atwood and Rublee retired from the syndicate business in 1866. 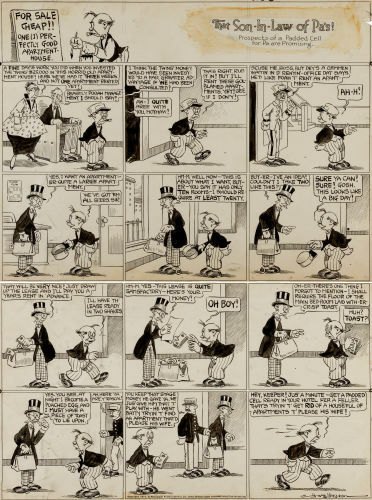 In the meantime Kellogg had foreseen the possibilities of syndicate service growing into a profitable and important business independent of any parent-newspaper affiliation. After Appomattox, Weirich returned to Baraboo to resume his work in the print shop of the Republic. 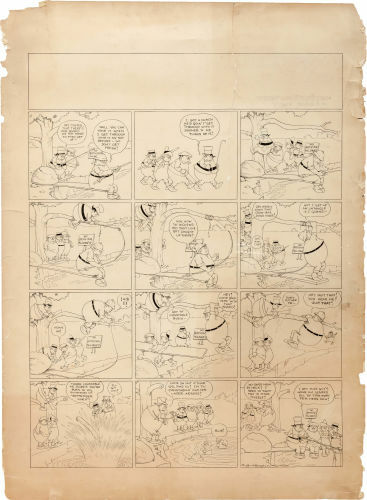 Kellogg no longer needed his services but he was willing to sell the paper to him. So Weirich became the publisher and Kellogg, with the proceeds from the sale, went to Chicago to launch his new business.3 His first step was to purchase the Railroad Gazette, a nine-column weekly published at 128 South Clark Street by Stanley C. Fowler. The latter was assisted by James J.Schock as foreman, compositor, make-up man and "devil." 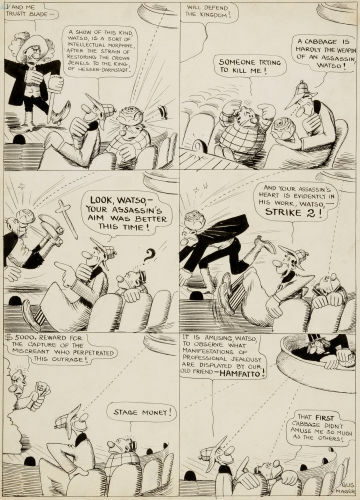 Kellogg retained Schock in his employ, remarking that in case his plan for supplying printed sheets to country papers was not a success the Gazette would "help out some in making a living for us." Next he sent out a circular, announcing the new service and soliciting orders for it. 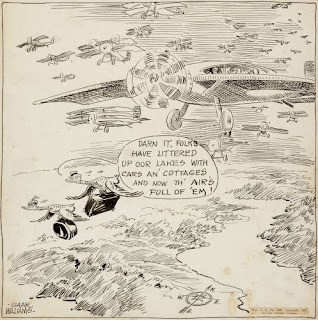 His first one, from John Turner of the Mauston (Wis.) Star, was received on July 10 and during the next three weeks he procured six more.4 Encouraged by this response Kellogg went ahead with his plans. He made arrangements with S. P. Rounds, who had a small press in his print shop at 48 South State Street, to do the printing and Schock began setting the type—by hand, of course, for Ottmar Mergenthaler's machine was still an unrealized dream. August 14 brought an eighth order, from C. Swayze of the Stevens Point (Wis.) Pinery. Kellogg was now ready to go ahead with his new enterprise. 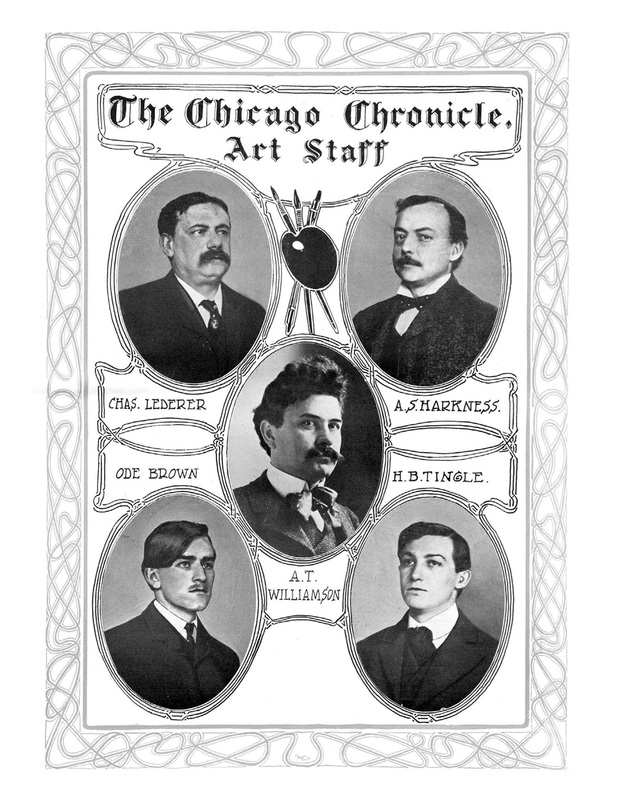 Under his direction, Schock locked up the type he had set in a pair of forms (two seven-column pages) and carefully lowered them from the office on the second floor at the South Clark Street address. Then he loaded them on a hand-cart and trundled them through the dusty streets of Chicago to Rounds' printshop. There the forms were slid onto an old flatbed press and on August 19, 1865, Kellogg's syndicate service became the first to be printed from type set exclusively for country papers. Under such humble circumstances as these the A. N. Kellogg Newspaper company, the first independent newspaper syndicate, began. Kellogg's first printed sheets were seven-column folio "insides" all exactly alike, undated and without even a heading for each newspaper. Under this plan, if the package of printed sheets was not taken out of the express office by the publisher to whom it was addressed, it could be returned to Kellogg and sent out again to another customer using the same size sheet. The reading material in these sheets was "evergreen matter"—a story and various items of a miscellaneous nature. 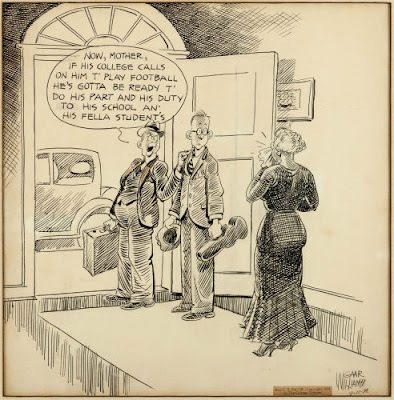 There were no advertisements or news, although very soon Kellogg was adding both to the content of the readyprint, especially after W. W. Hallock, a young Easterner, was added to his staff as advertising solicitor. Hallock was the first man in syndicate history to be thus employed. The second week there were nine orders for the service of the new syndicate and this number increased each week. By the end of the year Kellogg was supplying 53 papers in Illinois, Wisconsin, Michigan and Minnesota. His price for the printed sheets was 50 cents a quire. He advanced it to 55 cents on November 20 and to 70 cents on December 20, issuing on the latter date his first eight-column sheets. During 1866 Kellogg added 20 papers to his list, including weeklies in Indiana, Iowa and Missouri. In 1867 he extended his operations as far east as Ohio, west into Kansas and south into Tennessee, adding 33 more papers. Sixty more were added in 1868 including papers in Nebraska and Mississippi. The growth of his enterprise continued in 1869 with a Pennsylvania publisher represented for the first time among his customers, and a total list of 193 papers receiving his service at the beginning of 1870. Because of the fact that all of the first printed sheets were exactly alike, no political matter was used in them. 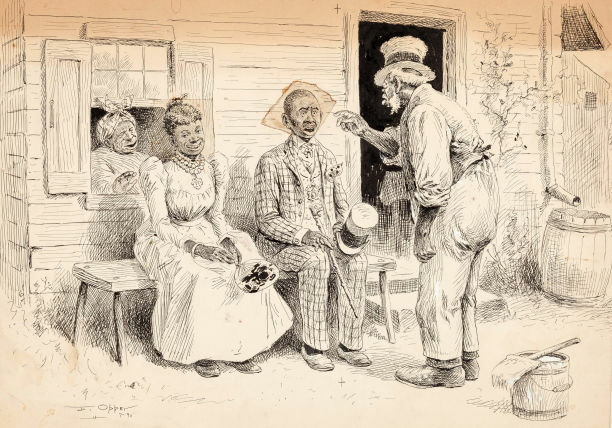 But in 1867, Kellogg's business had so developed that he was able to offer reading matter of any political complexion desired by the publisher. In the same year he made a further improvement by issuing six-column sheets and in 1868 he was furnishing nine-column sheets and six-column quartos. cheaper than Kellogg had something to do with their success. They were able to undersell their competitor because of the volume of advertising that Aikens had built up. 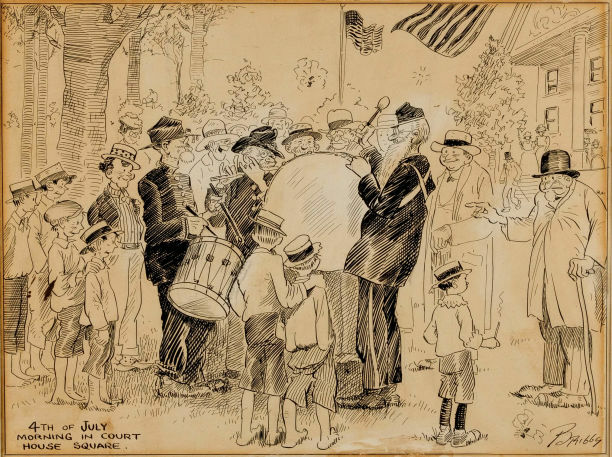 When he attempted to expand that advertising into the national field the Eastern agencies, such as S. M. Pettingill, G. P. Rowell and Company and Cook, Coburn and Company, would not listen to him. 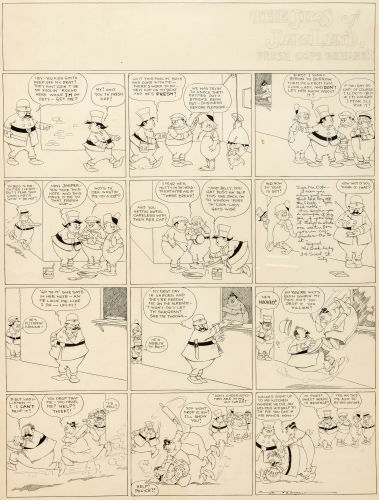 But eventually his talk of wide circulation won them over and they gave him contracts for advertising to be inserted in the printed sheets issued by his organization. 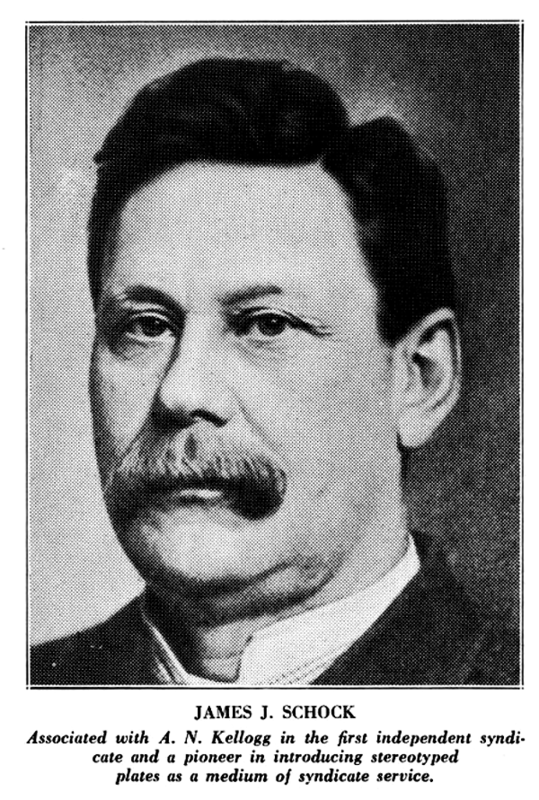 Aikens also tried to interest Rowell in establishing a syndicate business in New York, but at that time Rowell was unwilling to divert money from his advertising agency for that purpose.5 Furthermore, Eastern publishers whose editions were large and whose columns were already well filled with advertisements looked with less favor on the plan than the Western fraternity. I. F. Guiwits of the Franklin Printing company of Middletown, N. Y., discovered that fact when he formed a syndicate business in 1869. Those same Eastern publishers were somewhat indifferent to the auxiliary service idea and his business developed slowly. In 1866 Kimball and Taylor of the Belleville (Ill.) Advocate began issuing printed "insides" and the next year they offered publishers "outsides" as well. Up to this time all of the printed sheets had been "insides," the outsides being left blank for the local printing. 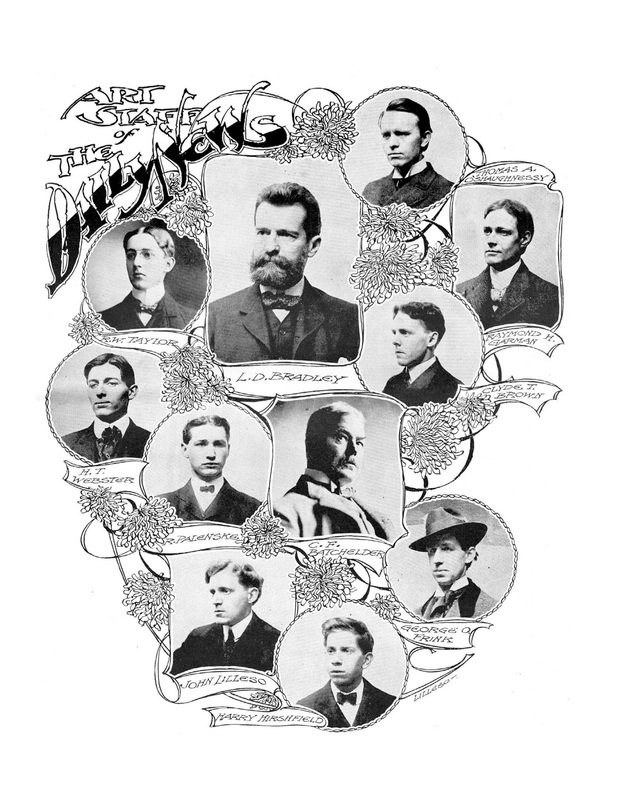 But after Kimball and Taylor started their innovation, the majority of the early syndicates followed their lead and offered both. The newspaper syndicate idea was now firmly established with four companies in the field—two as subsidiaries of newspapers and two as independent enterprises. 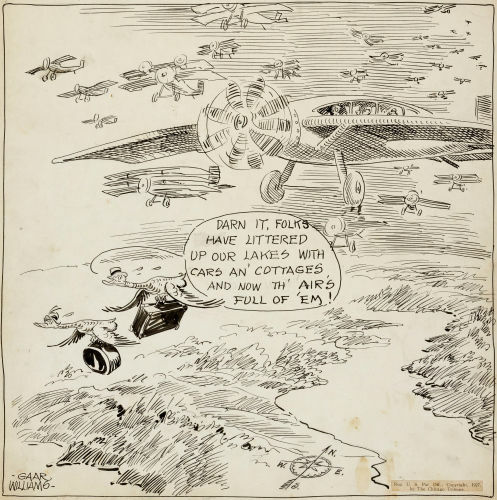 The stage was set for an era of expansion which, during the next three decades, was to extend syndicate operations into virtually every part of the United States. 1. 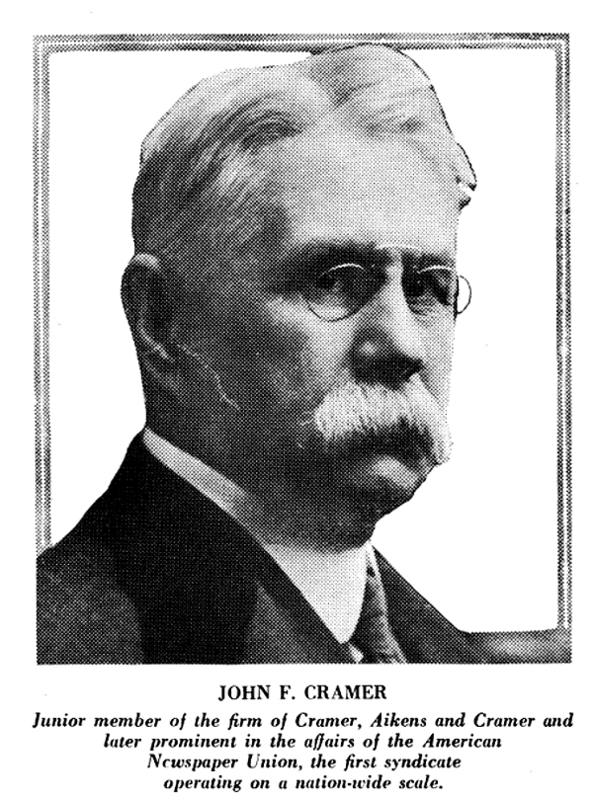 Cramer was born in Waterford, N. Y., in 1817. After his graduation from Union college in 1838, he studied law and was admitted to the bar. Handicapped by deafness, he decided to enter newspaper work and served on the staff of the Albany (N. Y.) Argus from 1843 to 1846. The next year he went to Milwaukee and established the Wisconsin, a daily. 2. From "Forty Years An Advertising Agent," by George P. Rowell. 3. Weirich continued as publisher of the Republic until his death in December, 1877. 4. 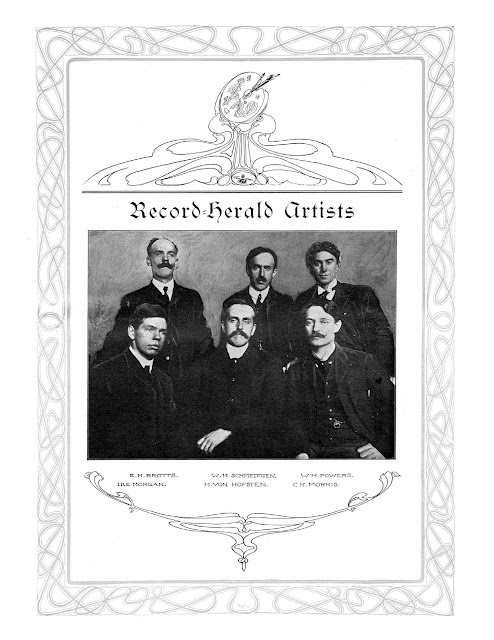 They were the Lanark (Ill.) Banner, the Red Wing (Minn.) Argus, the Metamora (Ill.) Sentinel, the Bushnell (Ill.) Free Press, the Paxton (Ill.) Record and the Rochelle (Ill.) Register. 5. 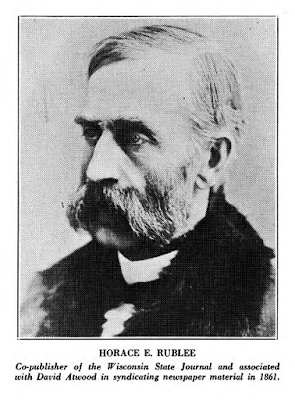 George P. Rowell was born in Vermont in 1838 and at the age of seventeen became a clerk in the business office of the Boston Post. In 1864 he founded a small advertising agency in Boston. 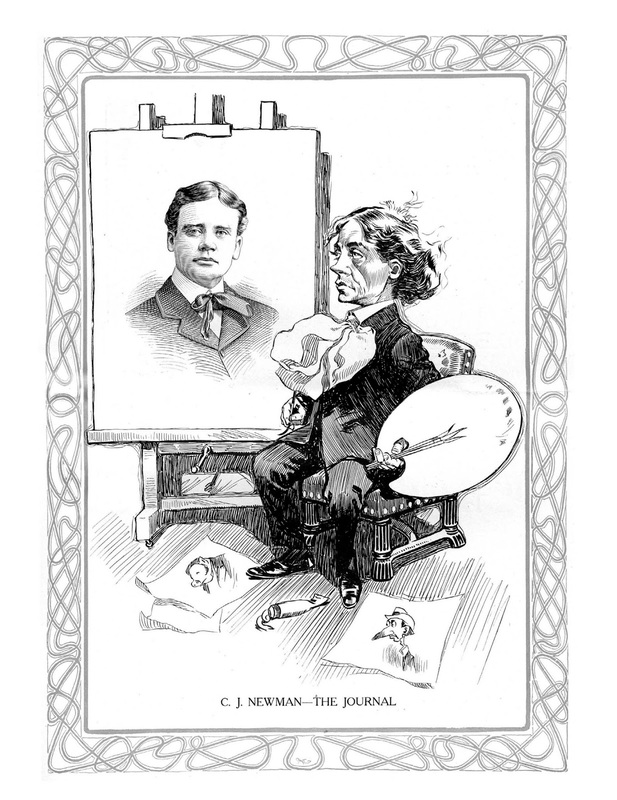 Three years later he moved to New York, enlarged his business and began publication of the first newspaper directory. One of his later ventures was the establishment of Printer's Ink which became the leading journal for the advertising business. He died in 1908. In his "Forty Years An Advertising Agent," Rowell credits Aikens with being the "inventor" or "originator" of inserting advertising in printed syndicate service. He says: "The advertising idea was new, novel and therefore patentable, as Mr. Aikens learned at a later date. He also learned that whatever value it may have had, he had thrown away by allowing it to be publicly used without protest." It is doubtful if the idea was patentable, otherwise a man of Aikens' business acumen would most certainly have patented it. 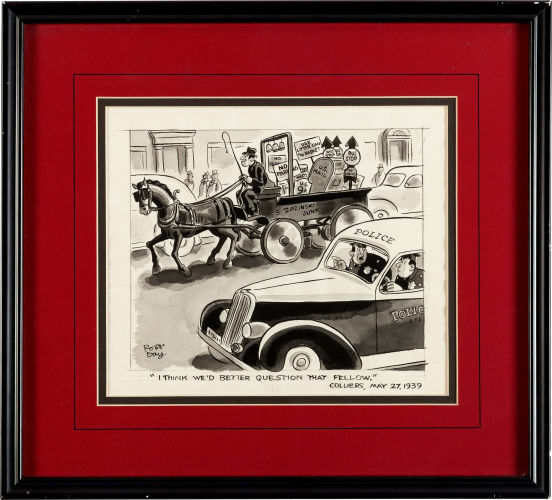 Moreover, it is difficult to see how Aikens could have established a claim of priority as "inventor" or "originator" of the advertising feature, since Atwood and Rublee had used it in their readyprint three years earlier. But from the belief that it was patentable arose the use of the term "patent insides" which for so many years was applied to this form of syndicate service. Love those deadpans! This cartooning business is *serious*! Love the prices on that art! 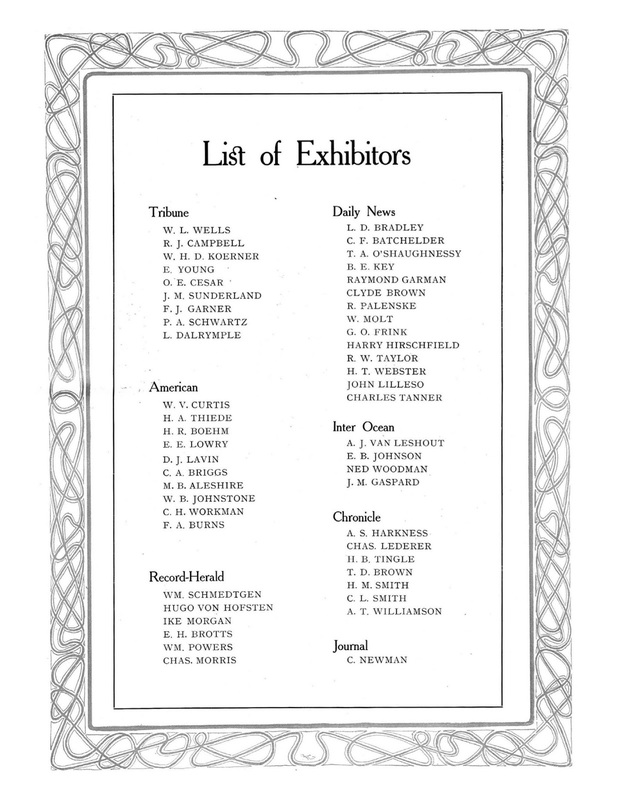 Are there any photos of the exhibition itself where we could see some of it? 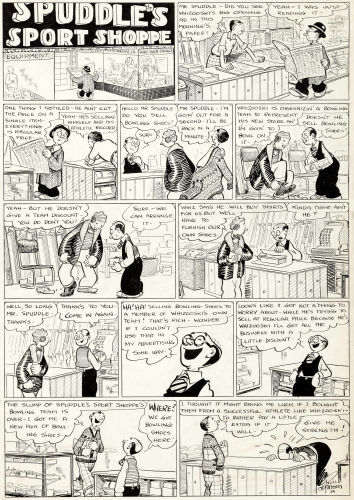 My uncle was Ike Morgan, if you guys run upon any of his strips please let me know. The very productive J. P. Arnot, a workhorse cartoonist who labored many years for Hearst with little fanfare or recognition, added a strip titled That Squares It to his repertoire in the summer of 1918. The simple concept is pretty well summed up by the title and the the sample above. I'd be a little surprised to learn if it ran anywhere other than in Hearst's New York Evening Journal. 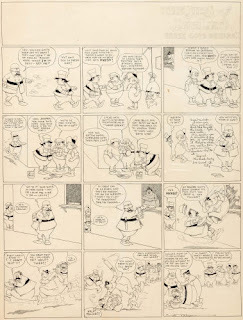 I get the impression that this strip was regarded as nothing more than filler, because Arnot continued to produce his regular daily strip, How Do They Do It?, while this second feature was running. That Squares It ran from August 26 1918 to January 17 1919. 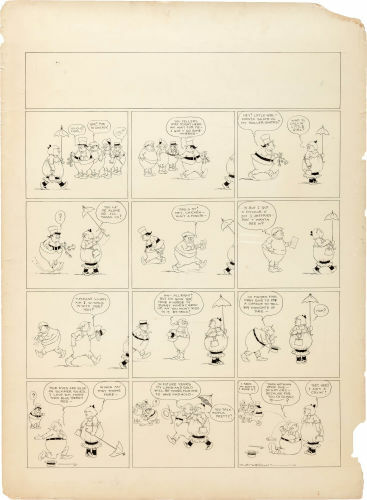 Arnot dumped it to begin another vertically oriented strip, The General (see here, here, here and here), which is my personal favorite of all his offerings. 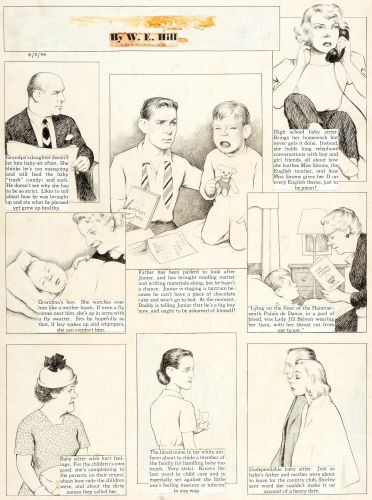 A Bringing Up Father Mystery: Whodunit? So the question is, who drew this week for McManus? I have my own guess, but the fellow I have in mind seems like a less than ideal candidate for a few reasons. Who do you think this is? Hi Eddie -- That's absolutely who I had in mind. Hard to believe, though, that even the great McManus would have rated getting T.E. Powers as an unsigned ghost! I have a great assortment of original art in this week's Heritage Internet Comic Auction. The auction opens today and closes on May 29 (Sunday). To view and bid on any of my lots in this week's auction follow this link. 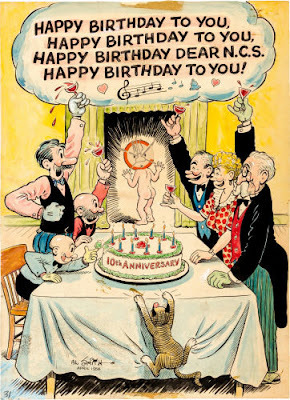 Great large color piece Al Smith did for the National Cartoonist Society's 10th anniversary, with all the Mutt & Jeff characters plus a self-caricature! The best Boots & Her Buddies original I've ever found -- by which of course I mean it has LOTS and LOTS of gorgeous gals! Superb patriotic July 4 panel by Briggs, with endless detail. The discoloration they seem to show in the photo I think is mostly an artifact. It was on my wall for years and I never noticed that. 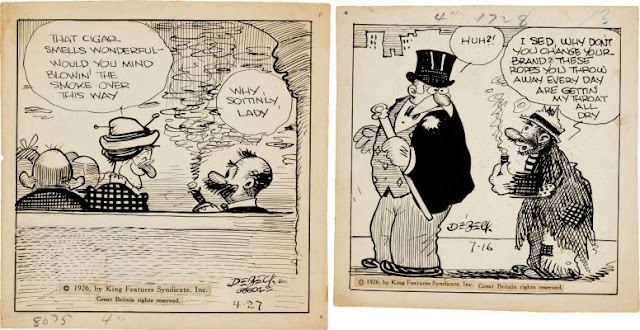 Two Bughouse Fables panels by DeBeck, who usually signed these "Barney Google". Great wall decor for you cigar smokers. Buz Sawyer daily with great aviation content -- check out that 'saucertop' radar plane! 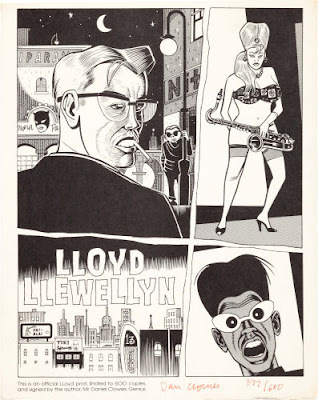 Early signed limited edition print by modern master Dan Clowes. Cool, man, cool. I can hardly believe I consigned this. 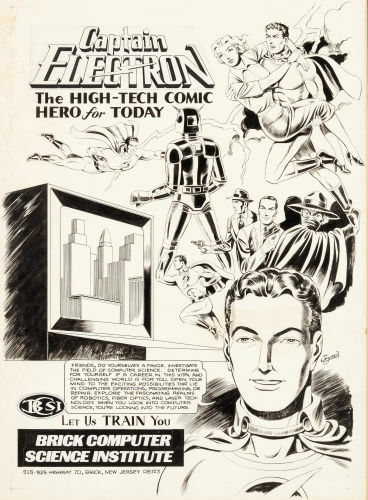 This great Jay Disbrow piece hung on my programming office wall for decades, and was a prized possession. 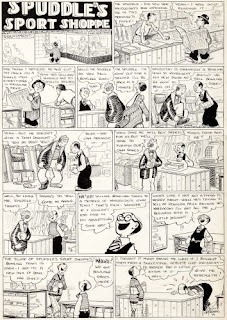 Nice early Tom Sawyer / School Days daily by Dwig. 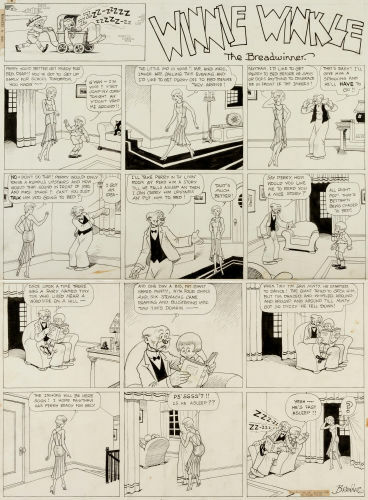 He really did manage to perfectly embody the Mark Twain ideal in this long-running panel series. 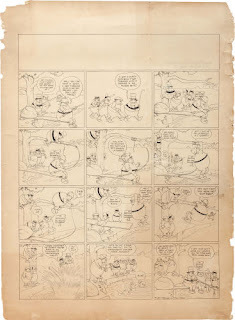 Beautiful Gasoline Alley daily with Skeezix reviewing his life, so typical of the great Frank King. Custom framed in beautiful hardwood. 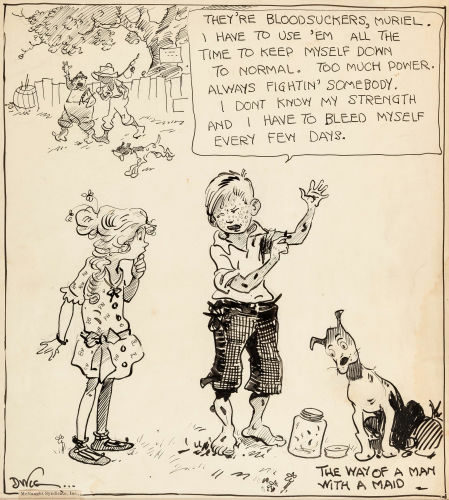 Delightful Gaar Williams daily. A neglected master. Another nice Gaar Williams piece, this one a very dramatic image with a horde of airplanes taking over the globe. 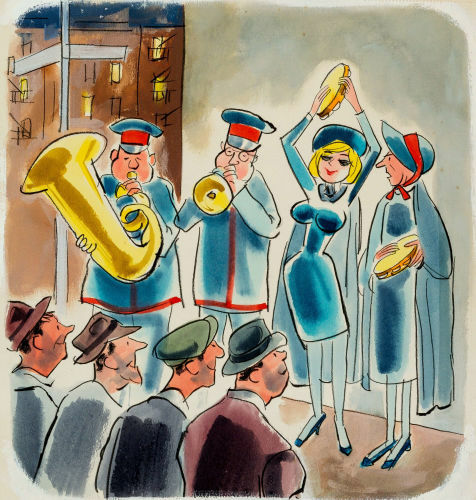 Great Leo Garel color cartoon was chosen as the cover for a Lawrence Lariar "Best Cartoons" collection. Classic Rube Goldberg -- should have been saved for one of their major auctions imho. Can't afford a Nell Brinkley original? Here's an H.B. Gordon piece that gives Ms. Brinkley a run for her money. What incredible detailed linework! A very rare find -- a Bill Holman gag cartoon original from the 1930s, this predates Smokey Stover and has most of the classic Holman elements. Museum quality framing, too. I love, love, love H.T. Webster's work, and there are two superb Caspar Milquetoast originals going this week. These are really hard to find, don't miss out. Three unpublished C.H. Wellington try-out pages from the mid-1910s, all in one lot. What a great title, "The Jims of Jamland"!! How did this not sell to a syndicate? The great J.R. Williams tells us one of the million reasons why mothers get gray. Neat train content, too. 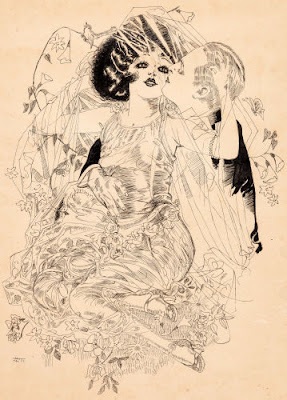 A sweet young thing has a yen for the teacher, beautiful drawn by Stan Drake in this early Heart of Juliet Jones daily. Another rarity that should be in a marquee auction. Very early Sherlocko the Monk strip by Gus Mager! The "you look just like Margie" guy in a rare foreground appearance in George McManus' Bringing Up Father. 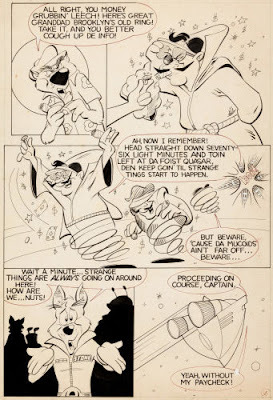 Ken Mitchroney created a character in his Space Ark comic book as an homage to Jim Ivey! This piece was presented to Jim many moons ago. 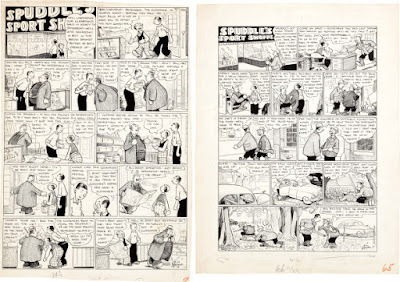 A classic Mr. Oswald strip by Russ Johnson. What an incredible artist he was. I just adore his work, which is very hard to come by, but I have several of them going to new homes in this week's auction. 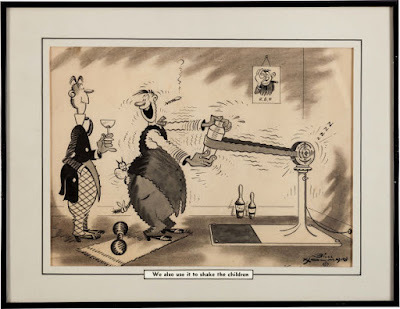 See above, a nice Mr. Oswald golf gag. 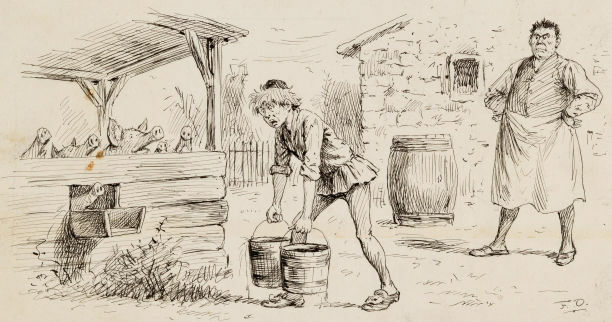 Amazing detail and terrific expressions in this 1890 Fred Opper original from Puck. I wish I knew the caption! Opper again, this time with a Puck story illustration. 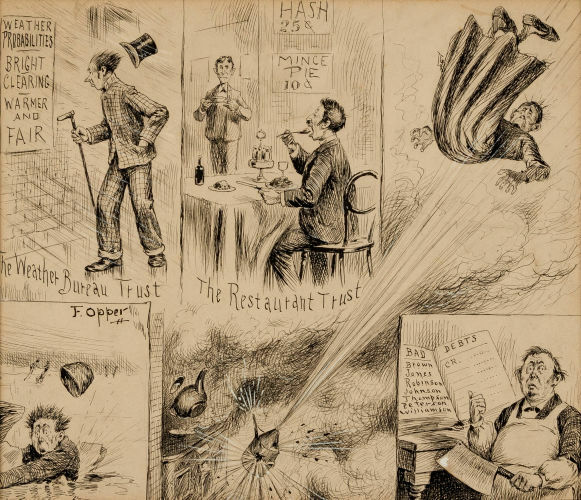 And here's a really terrific Opper multi-panel cartoon about the trusts. Trimmed unfortunately, but hey, it's 120+ years old! 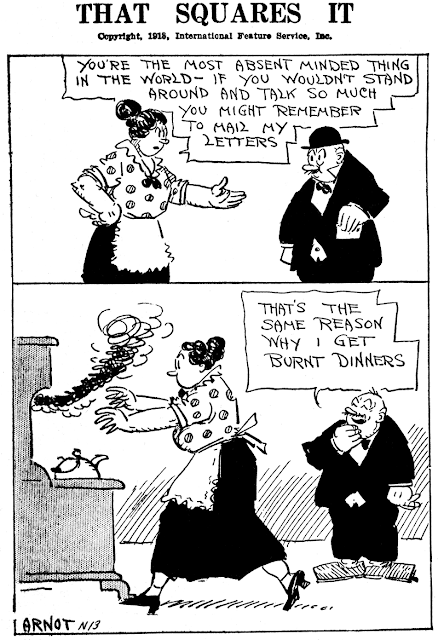 Delightful Robert Day cartoon from Collier's. Nicely framed too. 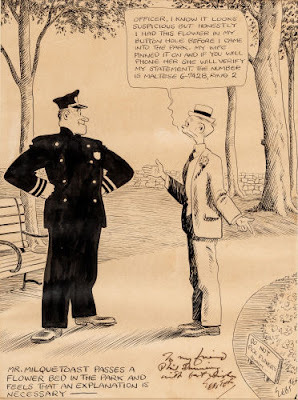 The incomparable Frank Godwin. 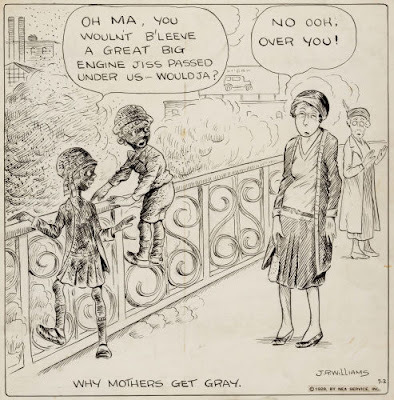 I was given my choice of one from a big stack of Rusty Riley originals, I chose this one for that great middle panel and the lovely bookending effect. The great Jim Scancarelli shows that it's not only Frank King who can do those delightful chiaroscuro panels. 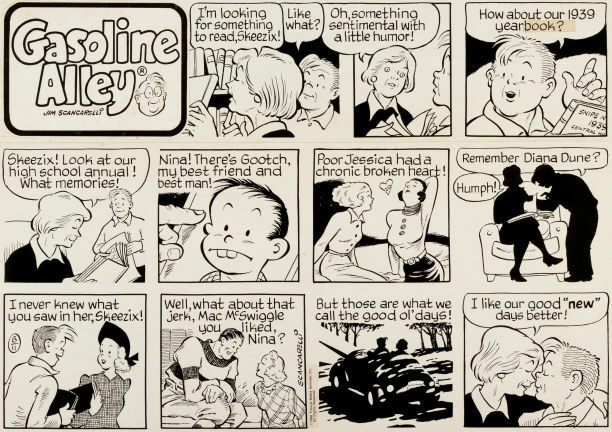 Sweet nostalgic Sunday page. That Son-In-Law of Pa's by C.H. Wellington, a nice early example, and huge! 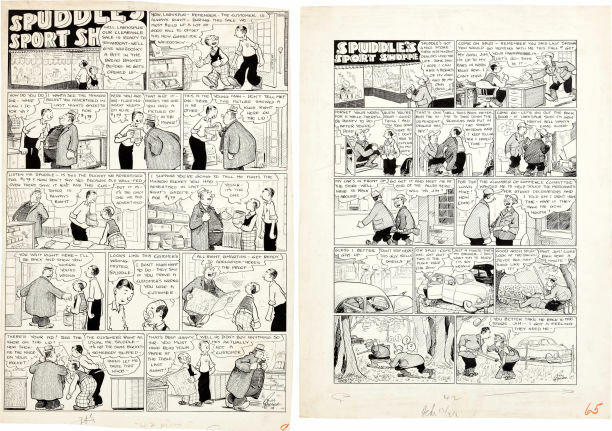 Three Spuddle's Sport Shop pages by the great Russ Johnson. Very few people realize that he did another series for a sporting goods retailer magazine -- just as fine as his Mr. Oswald pages. The other Timid Soul daily by H.T. 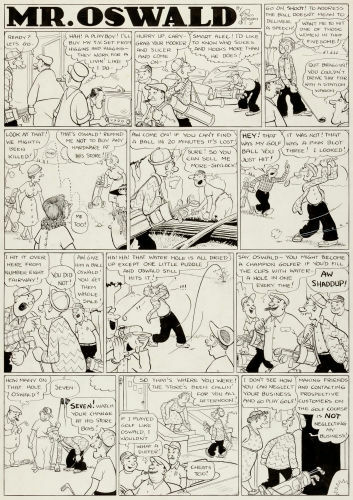 Webster (see above) , this one featuring a rare appearance in that era of an Asian on the daily comics page. The great W.E. Hill at the height of his powers, I prefer his 1950s stuff to his earlier work. Those finely drawn faces are so haunting! A huge Winnie Winkle Sunday page, lots of shapely Winnie, plus the very popular Perry. 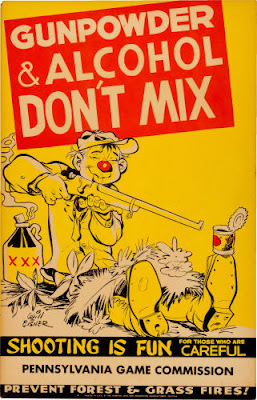 Three super-rare gun safety posters by Will Eisner. Very cool images, especially if you are a hunter. 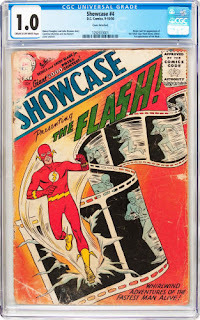 Is this the worst condition (complete) copy of Showcase #4 in existence?! Why they slabbed this is beyond me. Buy it, remove it from its coffin, and enjoy it! The great Zeke Zekley, still not allowed to sign his work even after the death of McManus. 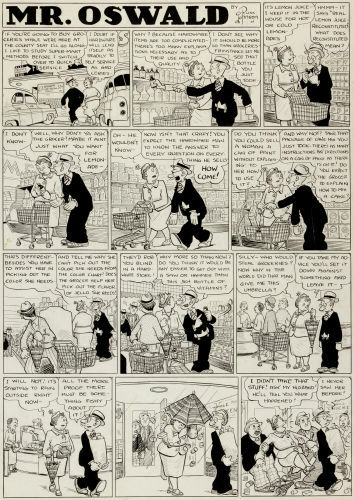 This was just a month after McManus' last signed dailies, and Zekely would be kicked off very soon. Man, that C.A. Voight could draw the gorgeous gals, couldn't he? Fabulous!